A small city’s worth of housing has been incinerated in California the past week — 8,760 homes destroyed in Butte County alone, north of Sacramento, and 432 more in Los Angeles and Ventura counties. During the past several days, the thousands of people who lost homes in fires at both ends of the state have scattered across California and beyond, to motels, government shelters and places like the East Avenue Church, where Patty Saunders, 89, ended up after barely escaping the mobile home community where for years she has subsisted on a $900 monthly Social Security check. Saunders said she had hoped to go to her daughter’s house outside Los Angeles. But her daughter had been forced to evacuate her home as the Woolsey Fire, which still rages west of Los Angeles, approached. So Saunders ended up at the church. A small city’s worth of housing has been incinerated in California the past week — 8,760 homes destroyed in Butte County alone, north of Sacramento, and 432 more in Los Angeles and Ventura counties. More than 81,000 people across the state have been evacuated from their homes. And temporary shelters, state and local officials said, are only meant to last through the emergency. On Thursday, President Donald Trump announced plans to travel to California on Saturday, to tour the damage and meet with those affected by the wildfires that have ravaged the state. Most hotels within 40 miles of the Camp Fire are full. 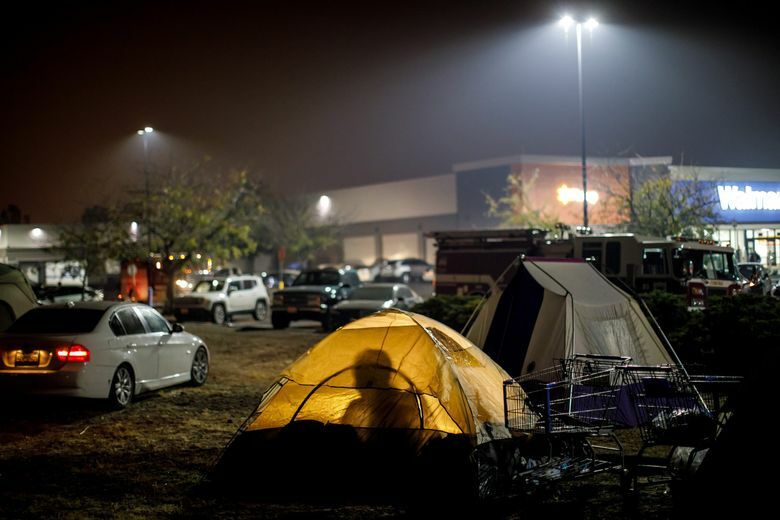 Families evacuated from the fire are taking extreme measures; some have pitched tents in a field next to a Walmart parking lot in Chico. One man near the fire zone in Chico, about 100 miles north of Sacramento, opened his land to people who lost their homes and need a place to park a trailer or recreational vehicle. Michael Cannon, 69, a caregiver and musician, created an impromptu shelter, with 11 or more people sleeping over in his four-bedroom house in Chico every night since the fire began, including an ex-wife, a son and three grandchildren — all displaced from their homes. California added 544,000 households between the end of the Great Recession in 2009 to 2014, but built only 467,000 housing units during that period, according to the McKinsey Global Institute. States such as New York added about 80 percent more housing relative to population growth during the same period. One possible solution, she said, would be for the Federal Emergency Management Agency to provide trailers that people could live in while their homes were being rebuilt. For now, though, officials are focused on providing immediate relief. “We are working right now to get people out of shelters and into more permanent sheltering options such as hotels, or even bed-and-breakfast inns — people have offered up rentals, people have been amazing,” said Shawn Boyd, spokesman for the California Governor’s Office of Emergency Services. 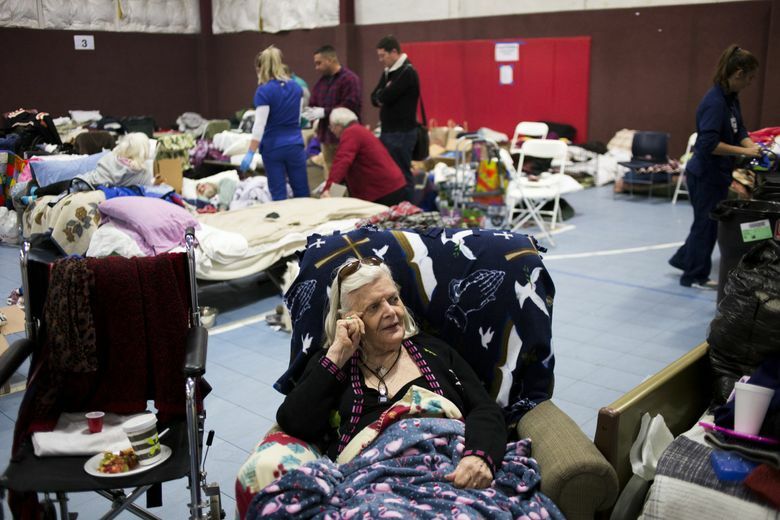 A joint care and shelter task force has been established between the state and FEMA, Boyd said, and task force workers have been deployed in Butte County. But with housing already tight, there are no easy answers. “This is a tremendous strain in an already difficult situation,” Boyd said. The Rev. Ron Zimmer, 50, lead pastor at East Avenue Church, said congregants were in a Bible study when the fire broke out Nov. 8 and made the instant decision to open the church to those who fled the fire. “Paul, when he’s leaving Ephesus, says give grace to people who need it, and give to those in need. The people who are here don’t have options,” he said of the 250 people who have sought shelter at the church. Some sleep in the gymnasium, others in tents pitched in the yard behind the church. Zimmer, who has been on many Christian missions overseas, said he has been reminded in recent days of being in Ukraine and meeting refugees from Crimea and Christians fleeing Syria. Cannon, the improvising house-host in Chico, said he hopes within the next few weeks to have a new space in a previously unfinished outbuilding in the backyard ready for habitation by even more of those who need it. One of his daughters chipped in to help with the costs, he said, and a construction company was hired to do the work. “I’m glad I can do something to keep my mind off it,” Levin said, a hammer in one hand, prybar in the other.